Woohoo, more sewing for me! I don’t know about you guys, but I’ve decided to not use the term “selfish sewing” when I sew for myself. Although that is essentially what it is, the word “selfish” has such a negative connotation and I just feel like we shouldn’t feel bad about sewing things for ourselves. I think sewing for ourselves is good for building skills, it’s practical, money saving and it’s not always easy! The fact that it’s fun and often rewarding is just an added bonus! 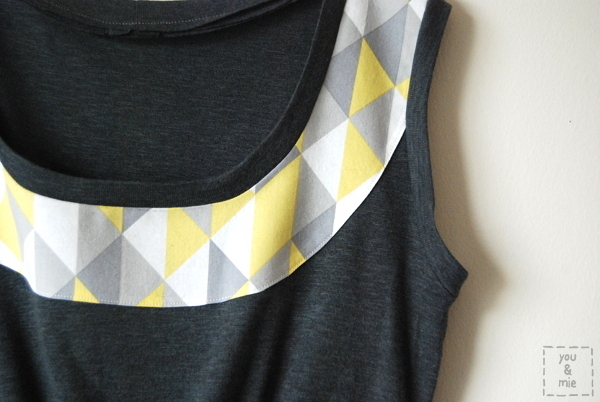 I got the idea to make this tank after seeing this one from Old Navy. I copied it almost exactly in style except I made an inverted pleat instead of a box pleat at the neckline. I don’t know if it’s the most flattering top because it doesn’t have a tight fitting bodice. But it’s comfy and I know it’ll fit for awhile, possibly through my pregnancy. The fabric I used is Star Pods in Green from designer Patty Sloniger for Michael Miller. I got it from Modern Domestic when I was up in Portland for Quilt Market. It’s a lovely chartreuse color and is really lightweight, so I thought the drape would be perfect for a top. 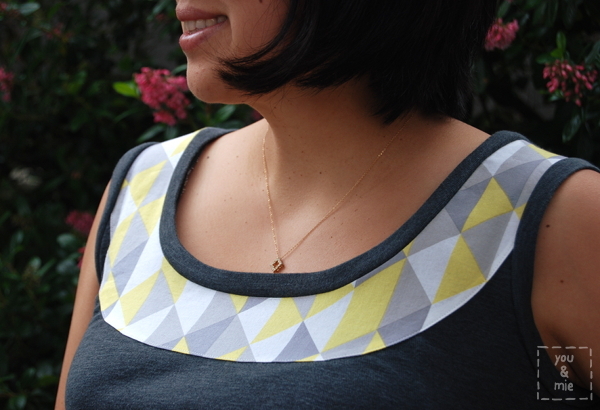 I used the Wiksten Tank pattern as a starting point and I’m going to show you how I adjusted it to make this top. 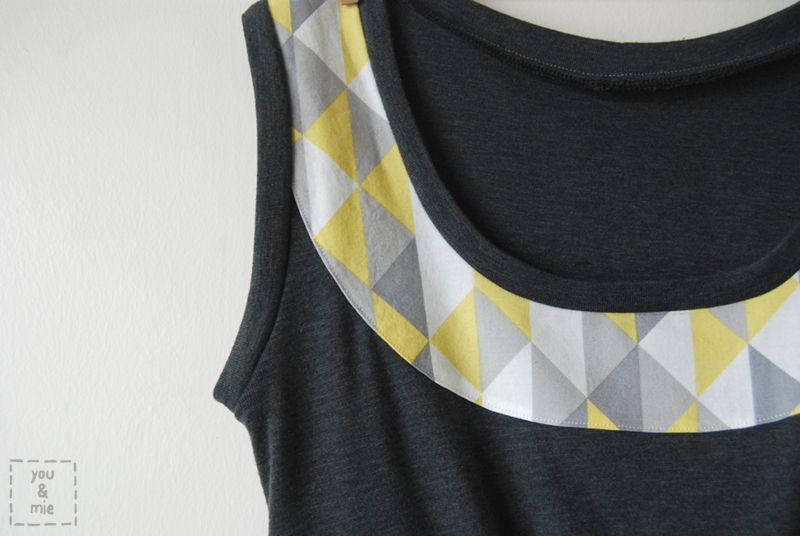 The Wiksten Tank is a great, simple tank top pattern that anyone can sew (you can see my previous versions here, here, and here). I recommend you add this to your pattern collection if you don’t have it. But if not, you can probably draft a pattern for this top using another pattern or a tank top you own with a similar cut. The only extra material you’ll need is some 1/4 inch wide elastic for the bottom of the tank. Alright, so using the directions, figure out your size and cut out your pattern. There were several adjustments that I made to my pattern. First I added 1.5 inches to the front piece along the “folded” edge. This will make the pattern 3 inches wider and give you room for that growing belly. I also raised the neckline an inch because I felt like the original was a bit revealing. I added about 4 inches to the length of the front piece, but kept the curved hemline the same. For the back piece, the only adjustment I made was lengthening it enough to match up with the side seam of the front piece (the 2 pink lines). 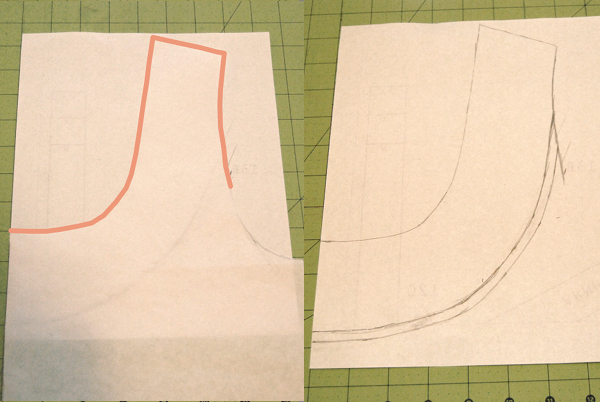 Then I made an ever-so-slightly curved line for the bottom of the back piece. 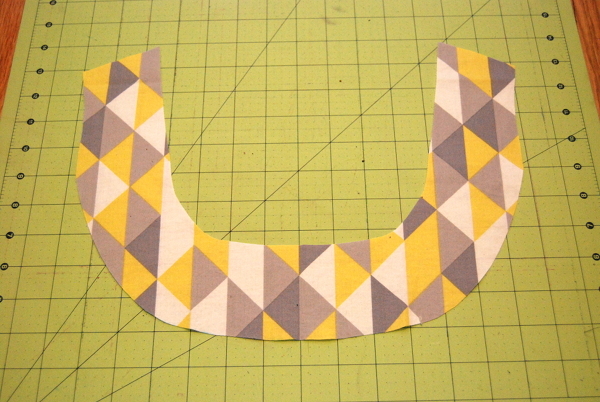 After you cut out your pieces, mark the center of the neckline on the front piece and then 1.5 inches on either side. These are your pleat markings. Bring the two outer markings in towards the center, pin and press. 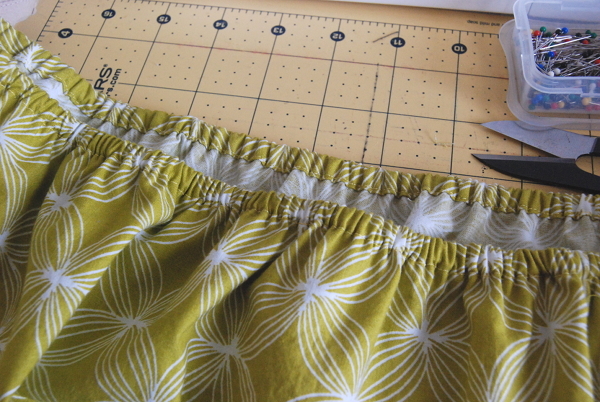 Sew a basting stitch across the pleat to hold it in place. 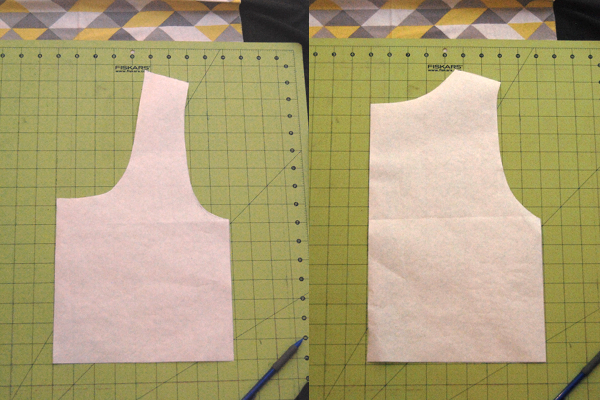 Once you’ve made your pleat, follow the pattern directions for constructing the tank. 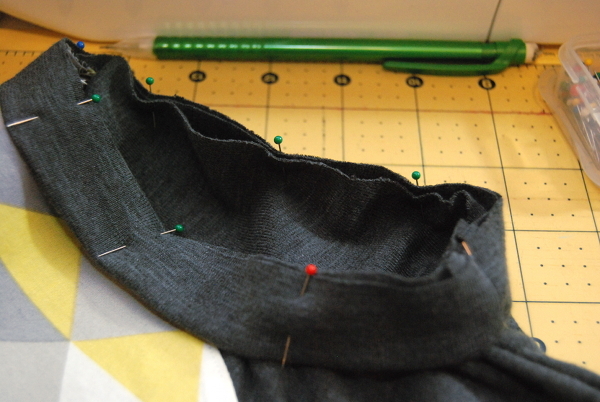 Sew the shoulder and side seams and finish the armholes and neckline with bias strips. 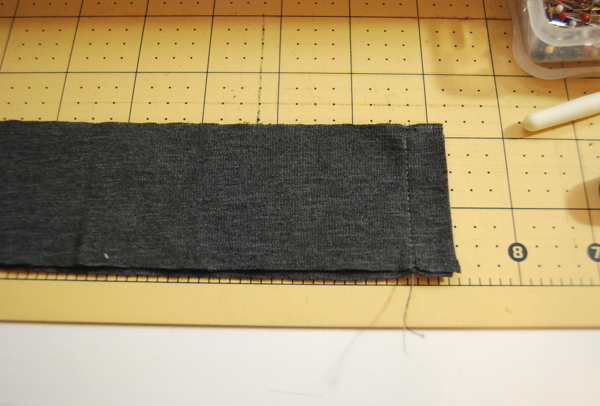 For the bottom, to make a casing, fold the hem up about a 1/4 inch, press and then fold again about 1/2 an inch. 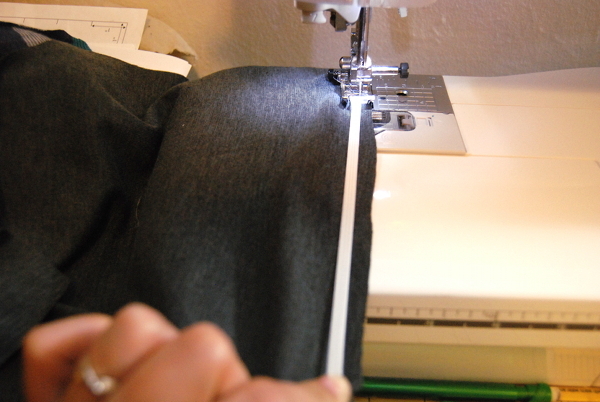 Sew along the folded edge all around the hem, but leave about an inch open to thread the elastic through. 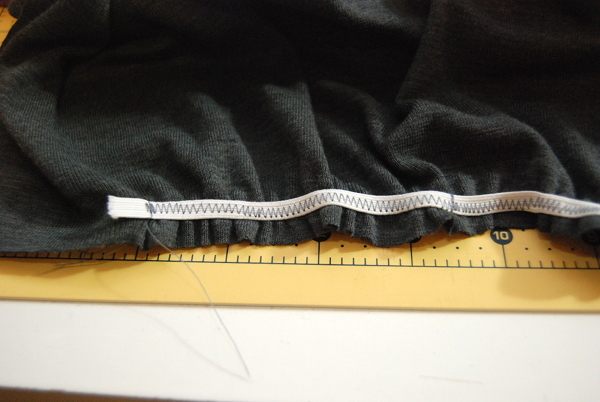 Measure your elastic and trim – it should fit comfortably but snuggly around your hips. Using a safety pin, guide the elastic through. Sew the ends of the elastic together and sew the rest of the casing closed. Here’s what the bottom of the tank looks like when it’s on. You can see the slightly longer length in the front for extra belly coverage. 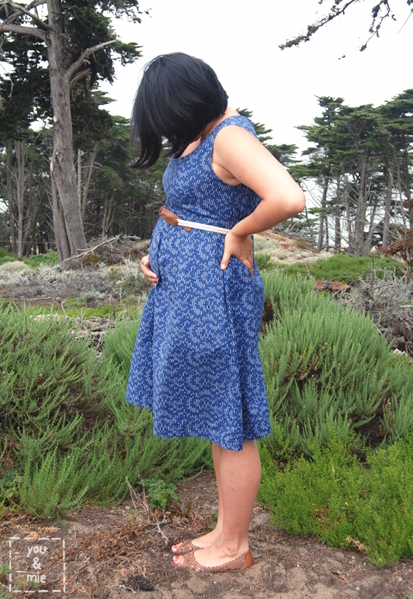 Ooh, by the way, thanks for all the sweet comments about the two “maternity” dresses I made and all the great suggestions for other maternity patterns and styles to try. I seriously feel like I want to make myself a whole new wardrobe now, I’ve never been so motivated to sew for myself! So I mentioned I’ve been sewing more for me, right? Well I have. 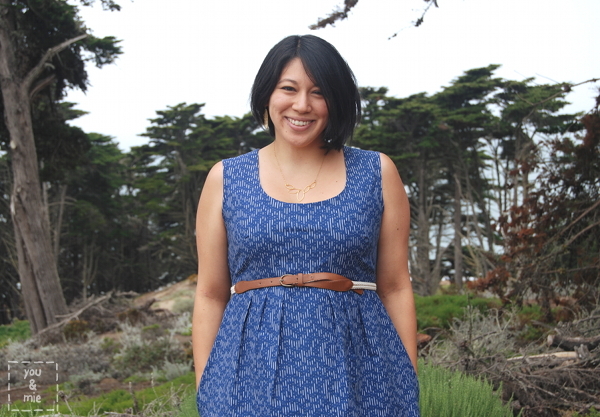 And this was actually the first recent project I sewed for myself that was a success – the trusted Washi Dress by Made by Rae. Before this dress, I tried 2 other projects that I ended up scrapping. Trust me, I have sewing fails too! So after that, I decided to turn back to the trusted Washi because I knew that I couldn’t go wrong. It’s nice to have a pattern like this that you know will boost your confidence and restore your faith. 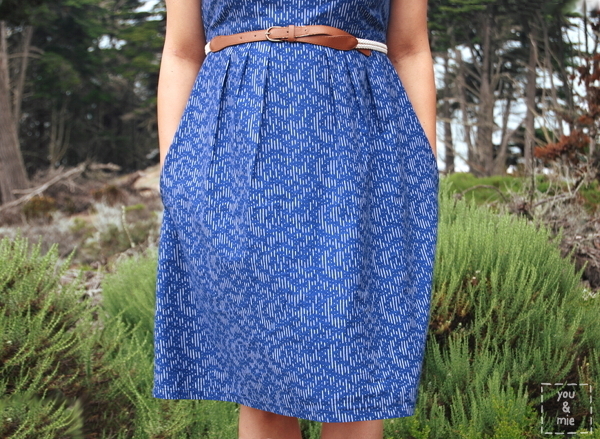 I made my first Washi dress as a tester last August and I called it Washi in Blue. 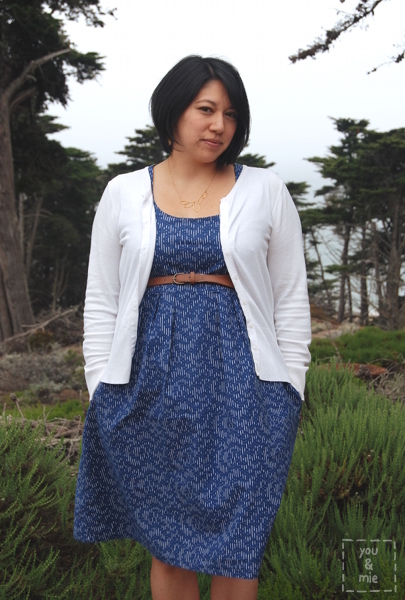 Well it just so happens that this dress is blue too, so I call it Washi in Blue TWO. Creative huh!? I also realized that I’m wearing the same necklace and same cardigan in both photo shoots. Hah! I need some new accessories. Anyways, I rave all about the pattern in my previous Washi post and my feelings haven’t changed a bit. 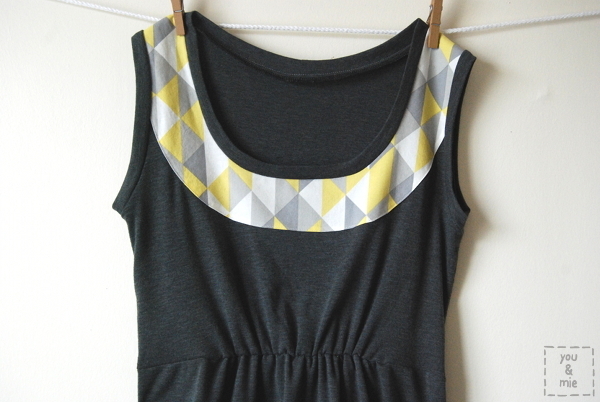 This is an AWESOME pattern, especially if you’re new to sewing for women but want to give it a try. It’s quick and easy and oh-so-cute. I love the style, it’s so flattering, in fact, I haven’t seen a version of the Washi that hasn’t looked great! The fabric is called Squiggles from the Dear Stella Maasai Mara line. I actually bought this back in September or October with a Washi in mind and it took me only, oh, 8 months to actually make. 😛 One of the great things about this fabric is that I actually packed this dress up in a suitcase, took it out all wrinkly, hung it up overnight and when I took it out the next day to iron it, it was wrinkle-free!! This dress is not a maternity dress, but I realized pretty quickly that the style is pretty accommodating for growing bellies as well. The dress I made last August still fits me! I love how fitted it is in the bodice and how much room there is in the skirt to either gloss over a belly you’re trying to hide (trust me, I had a belly before I was preggo), or make room for one you’re proud of 🙂 And I know that I’ll be able to wear this dress way after I’m pregnant too! Because my bust size had changed since I got pregnant, I decided to go a size up (to an XL). But after I sewed it up, the bodice ended up being way too big and it would gape open with the slightest lean forward. That was no good, so I ended up taking in the bodice 1.5 inches on each side. Now it probably resembles a large in the bodice, but an XL in the skirt, so it’s got extra room for tummy. I also kept the length longer than I normally would so that when my belly got bigger, the dress would still be long enough to wear without leggings or pants. If I were to make another dress for my maternity months, I’d probably cut the front bodice and back pieces in the large size and the front skirt piece in an XL and maybe deepen the pleats to make it fit the width of the bodice. Since I haven’t figured out the best way to shirr on my machine, I decided to make a casing for elastic. It looks different from shirring of course, but it was easy and allows for that snug yet comfortable fit. As for the neckline, I decided to raise it a little to keep myself well covered, but widened it a bit. Kind of like Kristin’s famous scoop neckline, but a little less wide? At almost 27 weeks, these pictures were taken just a few days after these photos, but I look smaller. Funny how different outfits do that. Anyways, I have a few more things to share that I’ve sewn for myself and a few more on my to do list. You guys are going to get so sick of pictures of me! And trust me, I don’t like taking these pictures. But I figure at the very least, I’ll have some photos of my growing belly! 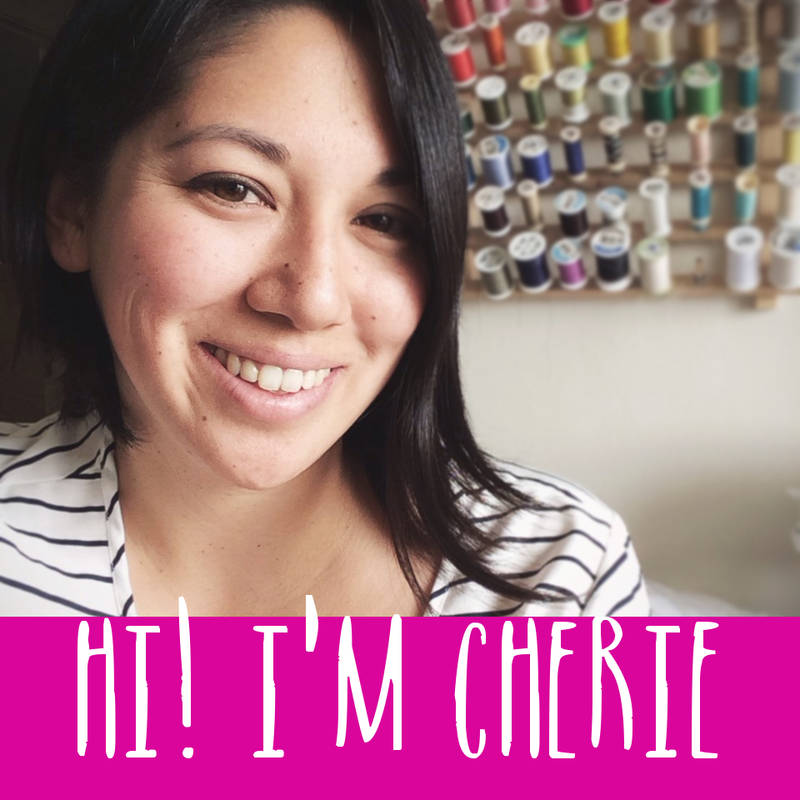 Have you been sewing for yourself lately? Have any maternity patterns you recommend? 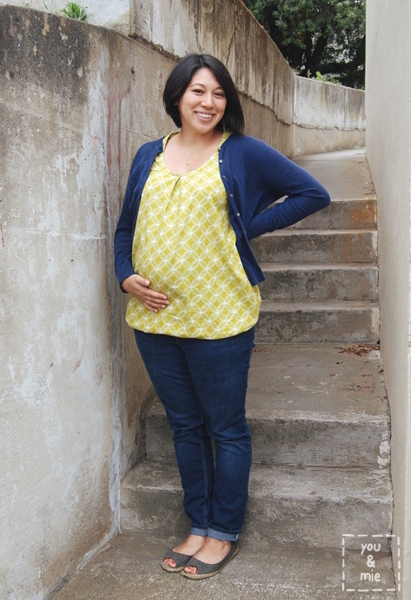 What are other flattering maternity looks you love? It’s June! Can you believe it? Summer is upon us and that means it’s time to bust out the sundresses. 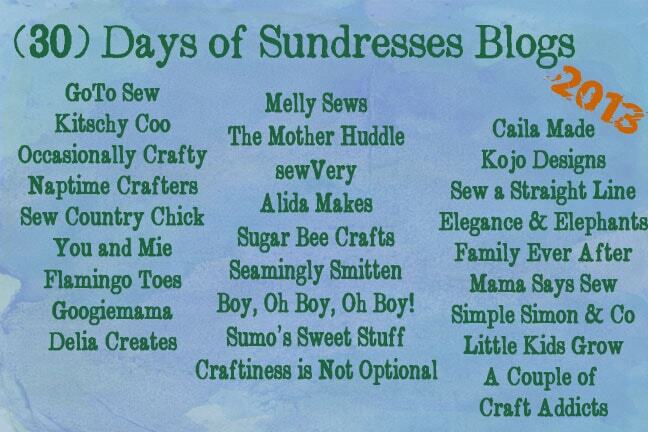 Melissa from Melly Sews is running her series, (30) Days of Sundresses, for the second time. All month – 30 sundresses! For girls and women – it’s really quite fun! Last year I made a beach maxi for my sister (and a matching dress for my daughter), and this time I decided to try make something for me! I’m not sure why but I’ve been really motivated to make clothes for myself recently. I’m not sure if it’s the pregnancy and the fact that I don’t fit into my clothes anymore and the selection at stores seems so limited, or maybe because Yuki refuses to wear anything but t-shirts and sweat pants and that seems boring to me, but I have all these ideas and a sudden urge to try sewing for me! I’ve already made 4 things already and I have plans for a handful more, so this dress is just the start of a lot of maternity wear up in here! 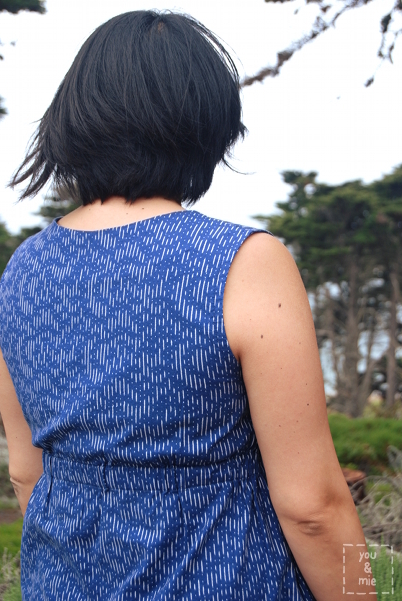 So I made a knit dress that was inspired by this dress from Old Navy . . . I wanted to try and make a floral neckline like the original version, but I didn’t have any fabric that was suitable, and I didn’t feel like painting any at the time. So I just picked some fun fabric from my stash, On Point in Golden from the Cloud 9 Simpatico line, to add the accented neckline. So the dress is made to fit and flatter a pregnant body, but I’m guessing this could look good on other body types too, especially if you lower the waistline. I’d love to see some non-maternity versions of this dress too! Alright, so you ready to start? 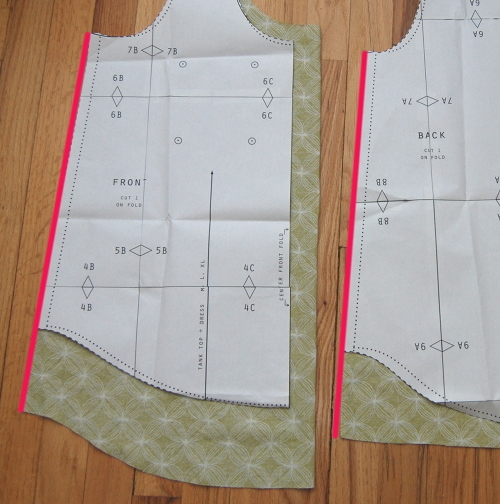 First you need to draft your pattern for the bodice. So find a knit top that fits well, not too tight, but not baggy either. 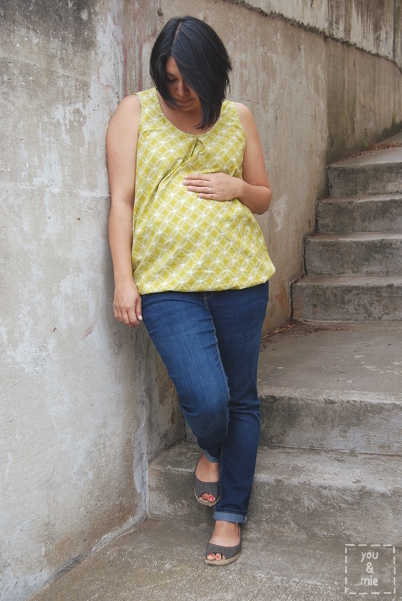 I used a combination of Kristin’s free Scoop Top pattern and a tank top of my own. 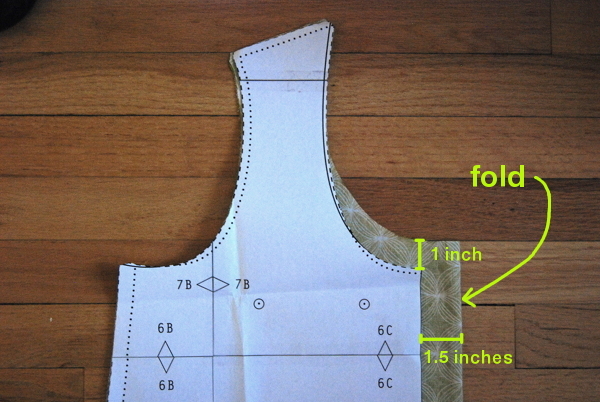 Measure where you want the bodice to hit and add 1/2 an inch to the bottom. To draft the accent neckline, place your front bodice on a piece of paper and trace the neckline, shoulder seam and half of the arm hole (see picture on the left). Remove the bodice pattern piece and decide how wide or what shape you want your accent neckline to be. I made mine a solid 2.5 inches around. Then add a 1/4 inch along the bottom of the curve for folding under. Cut out your dress pieces – one front bodice piece on the fold, one back bodice piece on the fold and the accent neckline on the fold. You’ll also need to cut a piece of fusible web from the neckline pattern piece, but without the added 1/4 inch along the bottom curve. For your skirt, you’ll want 2 pieces of fabric – the length will be determined by the measurement from the bottom of the bodice to the desired length. 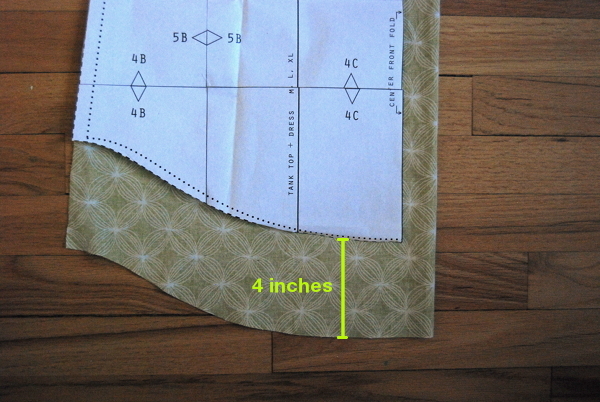 Make sure to add about 2 inches for hemming and seam allowance. I cut my skirt at a slight A-line, the top of the skirt pieces should be about the same width as the bottom of your bodice. You’ll also need long strips of your main fabric to finish the armholes and neckline. 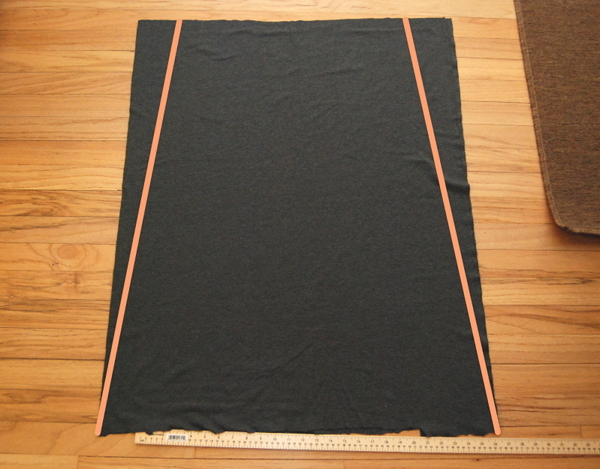 Cut strips that are 2 inches wide and make sure you cut them in the direction in which the fabric stretches. 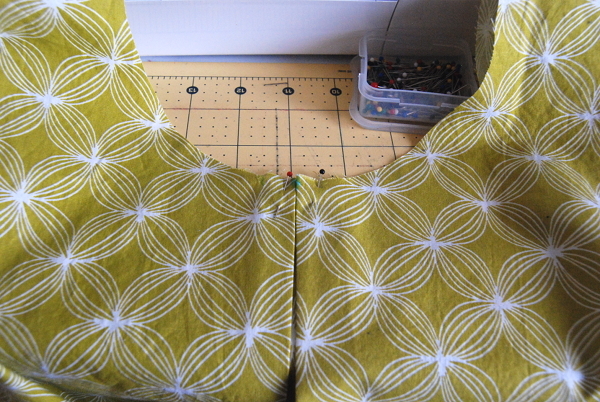 I like to cut them as long as I can and then trim them down later, but for rough estimates, I ended up needing two strips that were 2″ x 15″ for the armholes and one strip that was 2″ x 28″. Cut them a few inches longer at least to make sure you have enough. Fuse the fusible web to the wrong side of the accent neckline lining up the shoulder seams and neckline (the bottom curve will have a 1/4 inch without fusible web). Remove the paper backing. 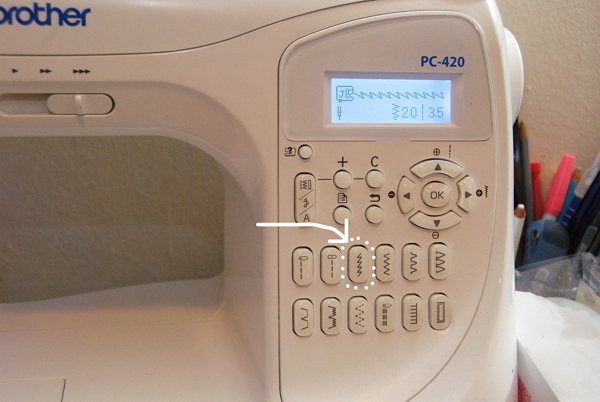 And here’s a trick I learned from sewing from Oliver + S patterns . . . Sew a basting stitch along the bottom 1/4 inch seam allowance. Press the curve towards the wrong side along the basting stitch. Remove the basting stitch. Fuse the neckline to your front bodice piece following the fusible web directions and sew along the bottom curve close to the edge. Next we’re going to attach the elastic to the bottom of the bodice pieces. 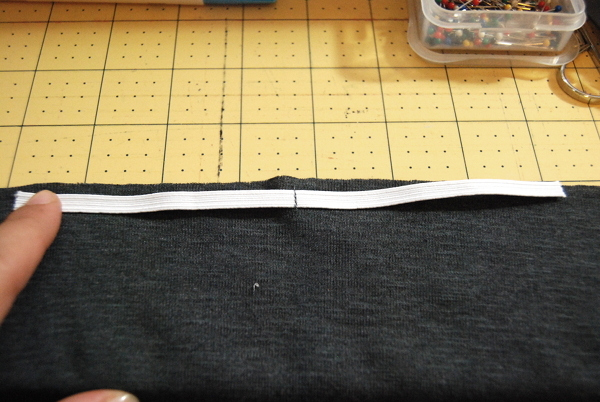 Cut your elastic into two 7 inch strips (approximately). Find the center of the front bodice and pin or baste the center of the elastic strip on the wrong side of the fabric along the bottom edge of the bodice. 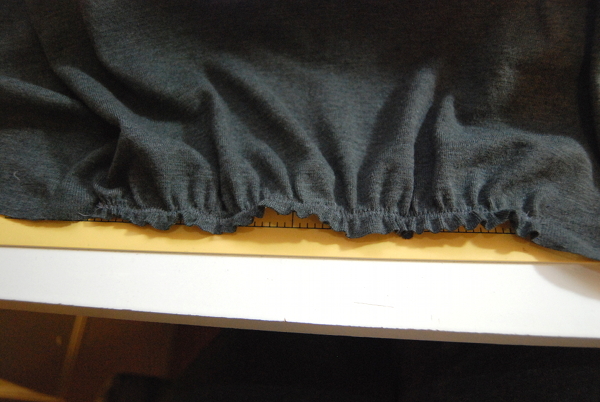 Because this elastic will be part of the seam allowance, I placed elastic close to the bottom of the bodice. Sew the elastic to the bottom of the bodice with a zig zag stitch stretching the elastic as much as you can, but being careful not to stretch the knit fabric. It should look like this on the wrong side . . .
And like this on the right side . . .
Repeat with the back bodice piece. To attach the bodice to the skirt, line up the bottom of the bodice and the top of the skirt with right sides together. I didn’t photograph this part, so I hope this makes sense. 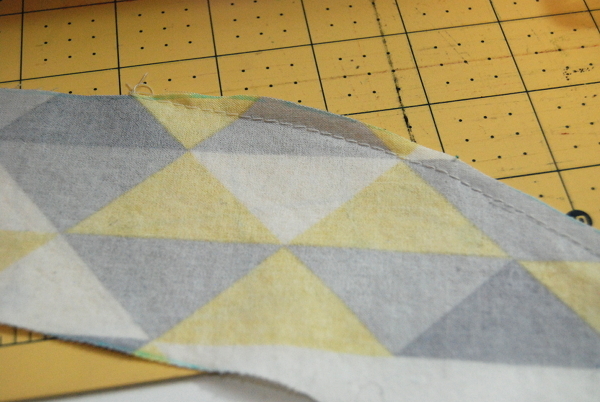 As you sew the pieces together, I like to use the slanted zig zag stitch because it allows for stretch. When you sew the bodice and skirt together, pull the elastic section of the bodice tightly without pulling the skirt piece so that it’ll gather. 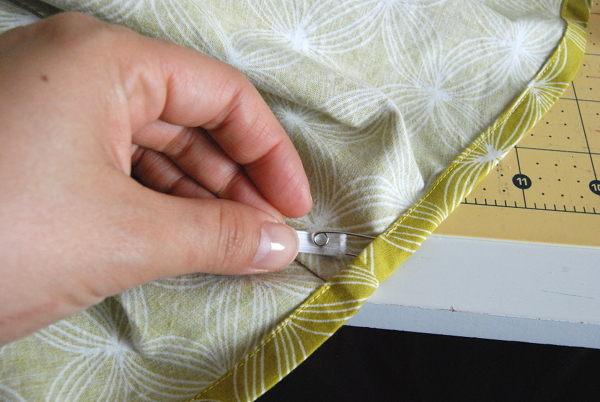 The elastic should be within the seam allowance so that it won’t be visible on the finished dress. So right along the inner edge of the elastic. 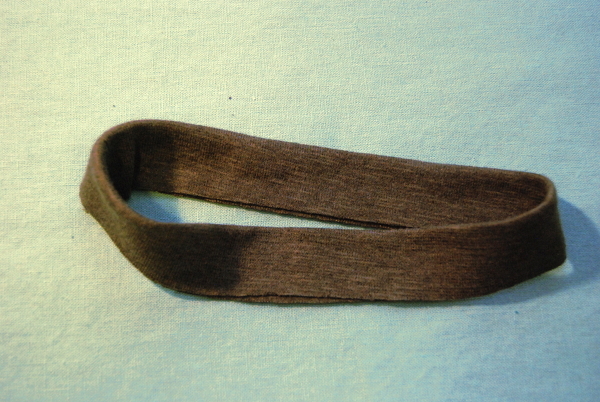 The sections on either side of the elastic should be sewn without stretching any fabric. When finished it should look like this . . .
Repeat with the back side of the dress, sewing the back bodice and skirt pieces together the same way. 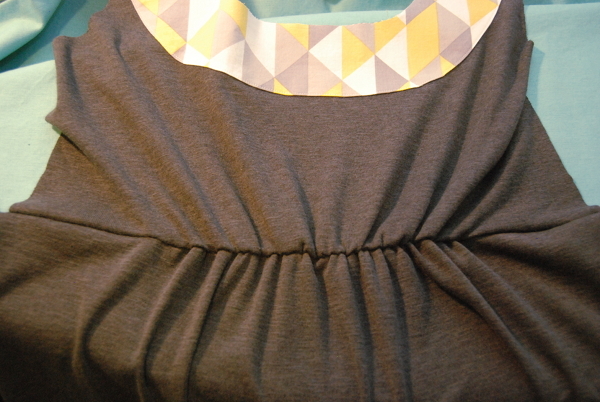 Place the front and back right sides together and pin and sew the shoulder seams and the side seams of the dress. To finish your armholes and neckline, you’ll need your 2″ strips of fabric. To measure the length you need, leave 1/2 an inch for seam allowance and then pin the strip to the armhole. Slightly stretch the strip as you go around the entire armhole and leave another 1/2 an inch for seam allowance when you get back to where you started. 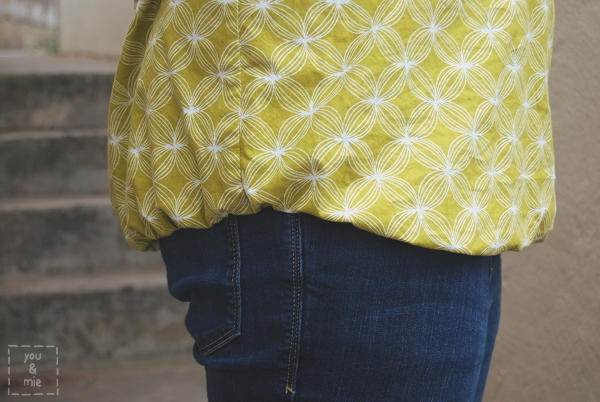 It’s important to stretch it slightly because you don’t want a loose, baggy or limp finishing, it should be slightly smaller than the armhole to create a finished band that hugs your body. Once you’ve found the length you need, trim off any access and remove the strip from the armhole. Sew the short edges right sides together with a 1/2 an inch seam allowance to create a circle. 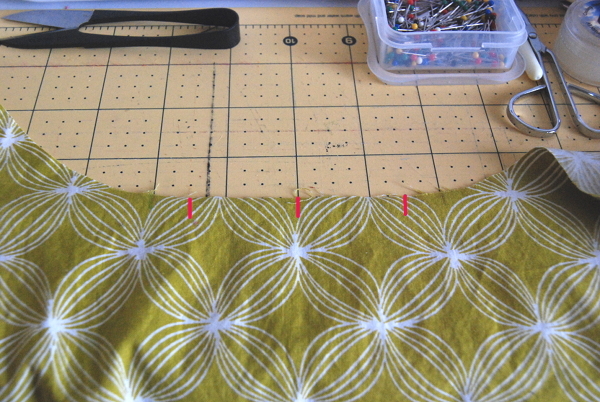 Press that seam open, then fold the loop in half lengthwise wrong sides together, so that raw edges should line up and the seam allowance is hidden inside. Press. With the dress right side out, pin together the raw edges of the armhole finishing with the armhole. Start by lining up the seams and pin all the way around stretching the band slightly and evenly as you pin. 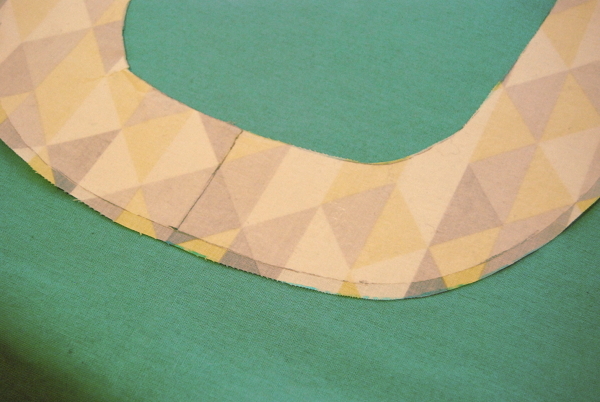 Sew along the raw edge using the slanted zig zag stitch. Finish edges if desired. Press well and top stitch, again, if desired. Repeat with other armhole and neckline as well. Hem the dress and you’re done!! With knits, I like to serge the edge and then fold it up once about an inch and sew close to the serged edge with either a double needle or the slanted zig zag stitch. That way the hem doesn’t get too thick with a double fold. So here I am at 26 and a half weeks. 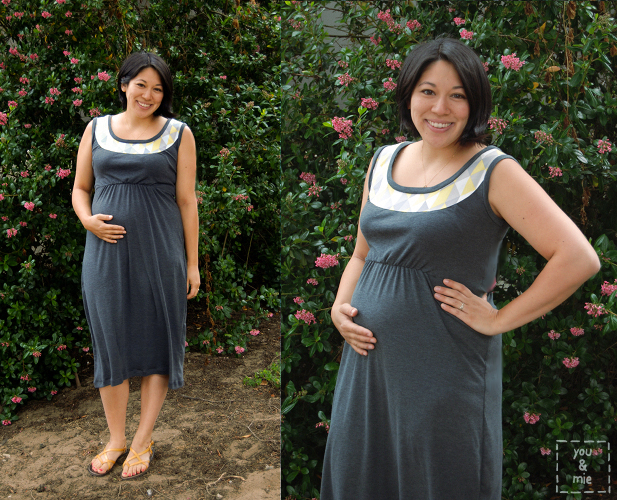 This is a very comfortable dress with a pop of fun, that I hope will take me through my entire pregnancy. 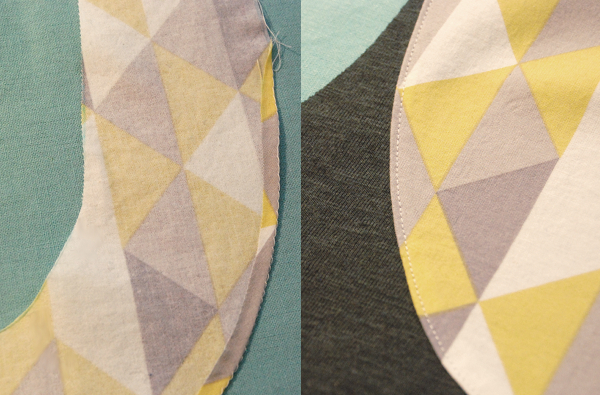 And I hope you’re ready for more maternity wear starting next week because I’ve been busy sewing for me! Wishing you a beautiful weekend . . .